Choux pastry buns filled with raspberry crème pâtissière and served with a rich chocolate caramel. Fresh raspberry and raspberry jelly skewers served with a chilled mojito emulsion. 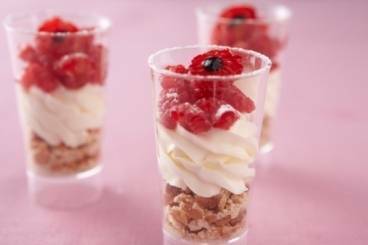 Learn to make your very own soft marshmallows flavoured with raspberry puree. 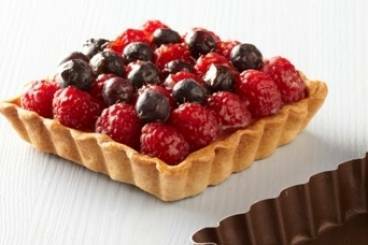 Sweet pastry tartlets filled with a homemade pastry cream and topped with fresh raspberries and blueberries. A simple but delicious dessert of succulent plums cooked in a raspberry caramel served with an almond crunch and fresh raspberries. 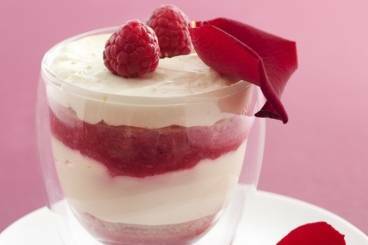 A very easy dessert of no-bake cheesecake made with cream cheese, butter biscuits and fresh raspberries. Cherry clafoutis served with a raspberry foam, pistachio tuiles and fresh raspberries. 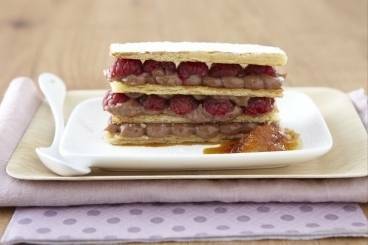 A classic mille feuille filled with a light mousse of Nutella cream and raspberries, served with an orange and Grand Marnier glaze.